Do you like to use games in Speech, but are tired of playing the same ones over and over? This Blog series will introduce some of my personal favorites! I love playing games with my students, both for motivation with my younger kids as well as for educational purposes. Games are so great for working on social skills such as turn-taking, conversation skills, sportsmanship, etc. The posts in this series will be organized based on the types of games, and will include cause & effect games, vocabulary games, cooperative games, logic/strategy games, movement games, card games, and social skills games. 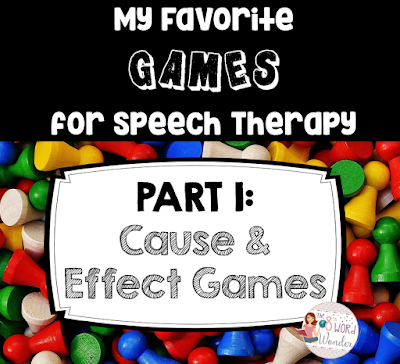 The first games I want to talk about are Cause and Effect games - these are games where one action makes something else happen, and these games work really well with my SDC and younger students. 1. Pop Up Pirate: Most of you probably own this game, but if you don't - get it! Turns are fast and this game is highly motivating for students of all ages. Players take turns sticking swords into a barrel until the pirate pops out. Language skills you can target are color identification, requesting, as well as concepts "in" and "out of". Because each turn is super-fast, it lends itself well to a quick motivator. 2. 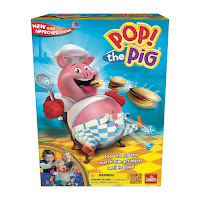 Pop the Pig: My SLPA introduced me to this game and this is another favorite of my students. Students take turns rolling a die and feeding the pig hamburgers. At the end of their turn, they press down on the pig's head, making his belly expand. If the pig's shirt pops open, the player wins. Good skills to target are color identification, counting, the concepts "down", and turn taking. 3. 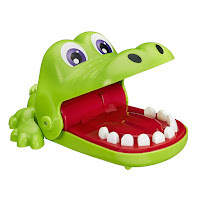 Crocodile Dentist: This is another favorite with quick turns. Players take turns pushing down a tooth until the crocodile's jaws snap shut. Good concepts to target are "push", "down", "closed", and "open". When you buy this, make sure you get the Hasbro version - the knock-offs don't work well, as indicated by other reviewers. 4. Pick a Brick: I have a love-hate relationship with the game Jenga. While I like the concept, any little bump against the therapy table makes the whole thing come crashing down. This is where Pick a Brick is a great substitution and perfect for little preschool hands, too! The concept is similar to Jenga - players remove a block by pushing it out of a wall. The goal is not to make the chicken that sits on top fall down. A difference is that blocks do not get stacked on top of the wall after being removed. 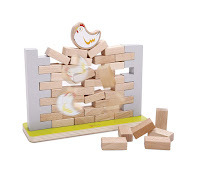 Because the blocks are being contained between two pillars and sit on a sturdy base, the blocks don't fall down if the table gets bumped (although the chicken might fall off). Concepts to target include "push", "on top", "off". 5. 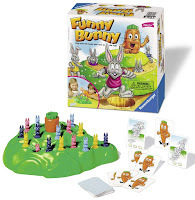 Funny Bunny: This game gets requested often by my students. 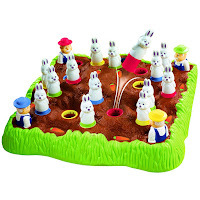 Players move their bunnies up a mountain while trying not to fall into the holes on the path. I have a more in-depth review of Funny Bunny here. Skills to target include counting and words for final consonant deletion. 6. Bunny Hop: This game is another popular choice among my students. A more in depth post about it can be found here. Students roll a die and see if a bunny of a particular color will jump out of the board when a farmer is pressed down. The first player to collect a bunny of each color is the winner. Good skills that are being targeted with this game are color identification and memory. 7. Candyland Castle: This is one of my favorites, but unfortunately it is out of print (I already e-mailed Hasbro about it - no chance of this one coming back anytime soon). If you ever see it in a thrift store or at a yard sale -- grab it! 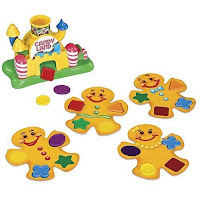 Every player has a gingerbread man board with four shapes on it. Players take turns pulling the candy cane on the castle to make a plastic shape pop out of the gate. If the shape matches one of the shapes on their board, they get to put it on. This game is perfect for preschool and younger students. Turns are quick and you can target shapes, colors, and turn-taking. 8. Cariboo: No list would be complete without Cariboo... which is sadly out of print (time to hit up the thrift store!). You all know this one-- Players pull cards and use a key to open compartments that have a matching attribute. If they find a ball they place the ball in a hole to see if the treasure chest will open. 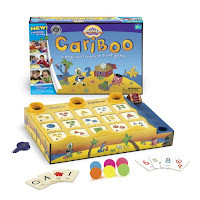 It is the perfect game to target letter / shape / color / number identification, memory, and matching. Additionally, you can replace the cards with your own to target specific language skills. Cariboo is one of my most requested games and I feel so fortunate to own a copy! 9. 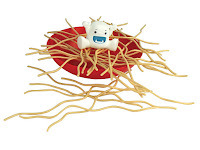 There's a Yeti in My Spaghetti: This is one of the newer additions to my speech room, and so far my kids have been enjoying it! Players pull out spaghetti in such a way to prevent the yeti from falling into the bowl. It's a good game for strategizing and turn-taking. 10. Jumping Jack: This game is like a reverse pop-up pirate. Players spin the spinner and either pull out 1 or two carrots, lose a turn, or take a carrot out of their basket. If the bunny jumps out when a carrot is removed, the player has to be able to catch the bunny to win. Otherwise the player with the most carrots is the winner. While I prefer Pop-up Pirate (faster turns, longer game play), this game is nice to throw into the game rotation. What Cause-and-Effect games do you play in YOUR therapy room? Please share in the comments!